Bandol, in the south of France in Provence is a sun-drenched wine region along the Mediterranean Sea known for making powerful red and lively rosé wines. The overall region has a long-standing viticultural tradition going back almost 2,600 years, largely started by colonizing Greek settlers and significantly bolstered by each successive wave of settling peoples. Proximity to the port of Marseille has meant that the region has benefited from access to historical, global trade routes, which has placed Provencal wines and the wines of Bandol on tables across the globe. 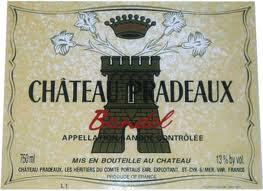 The principle grape variety of Bandol is Mourvèdre, which must make up at least 50% of the blend in AOC wines. Other allowable grapes are Syrah, Carignan, Grenache and Cinsault, although most of the best producers lean very heavily on Mourvèdre. Stylistically, the red wines are often massively tannic with long aging potential. Both dry and sweet red wines are produced. The rosé wines are light and perfumed, ready for enjoying on a sunny patio with lighter fare. A small percentage of white wine is produced, primarily from Clairette, Bourboulenc and Ugni Blanc, but it almost never gets out of the region. The soil in the vineyards is primarily limestone, sand and silica, which are ideal for growing Mourvèdre. Château Pradeaux a well-regarded estate owned by the Portalis family since the 18th century, has a reputation for seriously structured, often powerfully tannic wines made almost exclusively from Mourvèdre. The wines are aged in large old casks and are released as much as four years after the harvest. Successive bottle aging is the key to releasing the complexity of these wines, but be prepared to wait a while because the wines unfold very slowly. The 2005 is the current offering from Pradeaux and it will be a while before the wine is at its full potential. At an average retail price of almost $50 per bottle, it is not cheap, but it is a very special wine with tremendous potential. Fresh, lively nose with cherry, allspice and light floral hints. Full-bodied with moderate acidity and firm, tough tannin – good balance. Tight, unyielding palate with sour cherry, tobacco leaf, dried herb and tar. Moderate length – closed with traces of spice and cedar. Needs time – not for the faint of heart. The Côtes du Roussillon is one of France’s sunniest and warmest wine growing regions, with a climate and history that has more in common with Spain, its neighbor to the west, than its French cousin, the Languedoc to the east. The sub-region Côtes du Roussillon Villages is bestowed upon twenty-five villages to the south of Corbières, along the Agly River. Principle red grapes are Carignan, along with Cinsault, Grenache and Mourvèdre – only red wines are allowed to be made in Côtes du Roussillon Village, with Rosé and White wines allowed elsewhere in the appellation. Principle white grapes are Macabeu and Malvosie and produce wines that are a perfect match with seafood and shellfish. Château de Caladroy is a well-known producer in the region, with several bottling. The Cuvée Les Schistes represents their entry-level wine and at an average per bottle price of $18.99, before the discount, the wine is good value in a superb vintage. In its heyday, Château de Caladroy was a small outpost high in the arid hills behind Perpignan. It had its own school, workers’ quarters, stables, an elegant 19th century chapel, a manor house and other dwellings, and an ancient fortress dating from the 12th century—for Caladroy was once a fortress on the ancient Kingdom of Majorca’s frontier. All of this is perched on a knoll; below, on a broad saddle of a ridge, grow the vineyards. Although the school no longer functions and the workers’ quarters lie empty except at harvest, the chateau and its surroundings are striking. You drive up from Perpignan, a city which has a whole lot more in common with Barcelona than it does with Paris, and climb winding roads into the hills where the sparsely populated land is rocky and covered with scrub hardwoods and the ever present garrigue. At the top of the last rise, the road turns onto the saddle of vineyards; at the far end, beyond a windbreak of cedars, rises the Caladroy knoll with white buildings and red clay-tiled roofs. Looming in the distance are the snow-capped Pyrenees. This is Roussillon, the sunniest viticultural area in France, forever battered by a dry wind that sweeps off the high Pyrenees known as the tramontane. Fully exposed at over 1,000 feet above the nearby Mediterranean, Caladroy and its vineyards occupy the top of the Fenouillèdes hills, isolated between two river valleys. This altitude gives Caladroy’s wines a certain measure of finesse that nicely balances their darkly concentrated flavors. Today the vineyards have been extensively replanted, with Grenache, Syrah, and Mourvèdre dominating. Yields here average 25hl/ha, far below the permissible 45hl/he granted the top “Côte du Roussillon-Villages” AC designation. Moreover, the cellar was completely revamped in 2001, enabling cellarmaster Jean-Philippe Agen to make some super wine. 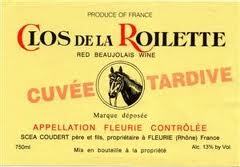 Earthy nose with black cherry, menthol and briarwood hints – classic southern France. Medium-to-full-bodied with moderate acidity and firm, dry tannin – good balance. Dark fruit core with black cherry, rose attar and tarry notes. Long finish – smooth with dark chocolate and cocoa dust. Lovely. Drinking well now and should improve with another 3 to 5 year in bottle. Maremma, a fertile agricultural area located in the southwestern part of the larger region known as Tuscany, is a very popular vacation destination. Its popularity is due in part to the nearly untouched beauty of the landscape, combined with impeccable cuisine and an up-and-coming number of quality wineries. Principe Corsini has a long-standing history in the Maremma, going back to the 17th and 18th Centuries. However, the Corsini were not known for their winemaking until Duccio Corsini began cultivating grapes on 10 hectares (24.3 acres) of land near the family estate, Marsiliana. Over the years, production grew and winemaking became a Corsini hallmark. 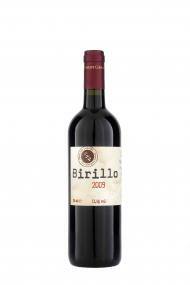 The Birillo is a classic Bordeaux-blend of 60% Cabernet Sauvignon and 40% Merlot, grown on sandy silt on clay. The average age of the vines is 13 years and the resultant wine spends 12 months in re-used oak barrels. Production yields approximately 86,000 bottles and at a per bottle price of $18.99, before discount, the wine represents a very good value. Earthy, rustic nose with dark cherry, anise and briarwood hints. Medium-to-full-bodied with moderate acidity and smooth, supple tannin – good balance. Sour cherry, cedar and saddle leather notes. Moderate length with a smooth, spicy finish. Drinking well now and should hold for another 2 to 3 years in bottle. Good value! I recently tasted a great Cabernet Sauvignon from the Columbia Valley that is just stunning – The 2007 Three Rivers Winery Cabernet Sauvignon – Wow! Like, move over California kind of wow… The wine is not cheap, with an average bottle price of $22.99, but the wine does represent a good value. With plenty of tannin and a nice core of intense, dark fruit, this wine has great aging potential and yet possesses enough elegance and grace to be drunk now with a nice thick cut New York strip. Jammy nose with plum, black cherry, menthol and saddle hints. Full-bodied with moderate acidity and firm, dry tannin – well balanced. Tight palate with an intense core of black fruit flavors – sour cherry, tobacco, anise and vanilla notes. Moderate length with a nicely layered and evolving finish. Drinking well now and should continue to improve with another 5 to 7 years in the bottle. Charming and elegant. A solid value! Washington’s first wine grapes were planted at Fort Vancouver by the Hudson’s Bay Company in 1825. By 1910, wine grapes were growing in many areas of the state, following the path of early French, German and Italian settlers. Hybrid varieties arrived in nurseries in the Puget Sound region as early as 1854, and by 1860 wine grapes were planted in theWalla Walla Valley. Large-scale irrigation, fueled by runoff from the melting snowcaps of the Cascade Mountains, began in eastern Washingtonin 1903, unlocking the dormant potential of the rich volcanic soils and sunny, arid climate. Noble varietals were planted in the Yakima and Columbia Valleys and wine grape acreage expanded rapidly in the early part of the 20th century. The arrival of Prohibition in 1920 put a damper on wine grape production, but ironically may have helped spawn early interest in home winemaking. At the end of Prohibition the first bonded winery in the Northwest was founded on Puget Sound’s Stretch Island. By 1938 there were 42 wineries located throughout Washington State. The first commercial-scale plantings in Washington State began in the 1960s. The efforts of the earliest producers, predecessors to today’s Columbia Winery and Chateau Ste. Michelle, attracted the attention of wine historian Leon Adams. Adams in turn introduced pioneering enologist Andre Tchelistcheff to Chateau Ste. Michelle. It was Tchelistcheff who helped guide Chateau Ste. Michelle’s early efforts and mentored modern winemaking in this state. The resulting rapid expansion of the industry in the mid 70s is now rivaled by today’s breakneck pace, where a new winery opens nearly every 15 days. This rapid growth ranks Washington State second nationally for premium wine production and more than 31,000 acres (12,545 hectares) are planted to vinifera grapes. Significant developments in Washington State include the formation of the Washington Wine Commission, a unified marketing and trade association, in 1987. In 1999, the Commission established the Washington Wine Quality Alliance (WWQA) to spearhead development of industry standards in winemaking and labeling. Washington is the first state in the U.S. to define standards for “reserve” wines. So, based on how much I enjoyed the 2009 non-cuvee bottling from Clos de la Roilette, I went back and actually bought some of the 2010 Cuvée Tardive. Wow, what a lovely wine and with quite a bit of aging potential to boot. The wine is definitely worth the $5.00 up-charge to $24.99 per bottle. Perfumed nose with floral, fresh cherry and mineral hints – Lovely. Medium-bodied with moderate acidity and firm, dry tannin – good balance. Tight with a dark fruit core – chewy with black cherry, tar and rose attar notes – dense. Long finish – closed with some spice on the aftertaste. Needs time, perhaps another 5 to 7 years before it even begins to open up. Adventurous chocoholics and lovers of fine wine are invited to join us as we experiment with various wine and chocolate pairings. At this event, we’ll examine different combinations of chocolate and wine to better understand how they can be paired for maximum enjoyment. We will taste a variety of milk and dark chocolate artisanal Candies, Chocolate-covered Strawberries, and Chocolate-Dipped Biscotti, and pair our delicacies with appropriate wines including Port, Sauternes, and Champagne. We’ll compare a wine in both its dry-fermented and dessert forms, and see how each pairs with chocolate. Join us for this indulgent experience, and learn how to match the flavors, sweetness, acidity, and texture of wines with chocolate. In the past I have conducted this tasting to focus on a specific region (say, Italy), but the time is ripe to look further afield of just one region and examine the flood of high-value wines available globally. I have long said that a person does not need to spend more that $10 to $15 dollars to find some pretty spectacular wine, and this event is going to prove it. At this event we will taste a number of wines from across the globe that represent good value ($10 – $15 range), some from lesser known regions and some from the usual suspects. Domaine Fenouillet, a moderately-sized estate in the town of Beaume de Venise, France has a long-standing tradition of wine production. Patrick and Vincent Soard, the current stewards of the winery speak lovingly of their great grandfather Casimir and his pioneering work in the vineyard, work that apparently earned him a silver medal in 1902. His son Louis continued the tradition with award-winning Muscat de Beaume de Venise, of which a 1953 bottling maintains pride of place in the current cellar. Patrick’s and Vincent’s father Yvon maintained the tradition until falling ill in 1978 and becoming too sick to work in the winery. Fortunately Yvon taught his sons well and the quality of their wines is a testament to their love for the family tradition. The estate produces a full range of wines including white AOC Vaucluse, white AOC Ventoux, rosé AOC Ventoux and red wines from AOC Beaume de Venise, AOC Ventoux and AOC Côtes du Rhône, in addition to fortified AOC Muscat de Beaume de Venise. Interestingly, I could not find the 2009 Ventoux listed on their web site, but that doesn’t stop me from really enjoying the easy-drinking nature of the wine. Judging by the taste and the composition listed for their 2010 AOC Ventoux Cuvée Oversant, I’m guessing that the wine is largely Grenache (75%), with Syrah (20%) and Carignan (5%) to round out the party. At an average per bottle price of $10.99 the wine represents an excellent value and a perfect choice for an everyday drinking wine. Fresh, lively nose with cherry, dried herb and black pepper hints. Medium-bodied with moderate acidity and moderate, dry tannin – good balance. Black cherry, lilac and earthy tones on the palate. Quite quaffable. Moderate length with a smooth finish and cedar and spice on the aftertaste. Drinking well now and should hold for another 2 to 3 years in bottle. Great value! Sardinia, like Sicily is a spectacularly beautiful island off the coast of Italy with a long tradition of wine making. The various wine routes throughout the island lead to breathtaking landscapes where viticulture has been in existence since pre-Roman times, a tradition that began with the people of the nuraghi and continues today into the modern age. From the Romans to the late Sardinina-Piedmontese kingdom, through the Tuscan and Genovese fiefdoms, the Benedictine or Camaldolean monks and the Spaniards, each culture contributed to the wine making traditions in Sardinia. Soil composition and climate play an important role in grape growing and wine production. With such a favorable combination of such elements, Sardinia is home to one of only four white DOCG wines: Vermentino di Gallura. Vermentino, with its delicate aromas of fruit and hint of almonds in the finish, is a wine to be enjoyed young. Vermentino di Gallura is typical of Sardinian wines – beauty, delicacy with exotic character and seductive flavors. This piece is not about Vermentino, but instead I am writing about a stunning little red wine made by the Argiolas family. The winery was founded in 1937, and consists of approximately 575 acres in the breathtaking land just north of the town of Cagliari in southern Sardinia. The winery produces 2.3 million bottles annually across eleven different wines. The Perdera is a blend of 90% Monica, 5% Carignano and 5% Bovale Sardo grown in the eponymously named vineyard. The Perdera vineyard is 74 acres of primarily clay and limestone, situated at an elevation of 650 feet above sea level. The average age of the vines is 32 years with a fairly stingy yield of 3.2 tons/acre. The wine is fermented in stainless steel tanks and then aged for about six months in French oak casks, which gives the wine a smooth, silky finish. The intense ruby color is a hallmark of the Monica grape, a Spanish transplant that oddly is no longer found in Spain. While not a candidate for long aging, the Monica grape produces fresh, lively wines with exotic spiciness that are eminently quaffable. At an average per bottle price of $11.99, the Perdera makes for an ideal daily-drinker! Earthy, barnyard nose with fresh cherry, floral and allspice hints. Medium-to-full-bodied with firm acidity and dry tannins – good balance. Dark fruit core with tarry, plumy notes. Moderate length with a spicy, dried fruit aftertaste with hints of cedar and vanilla. Drinking well now and should hold for another 3 to 5 years in bottle. Great value! Catherine and Jean-Luc Hubert are the owners of a number of properties in Bordeaux, one of which is Château la Grolet, a fully-biodynamic winery that strives to achieve purity and complexity in its wines without compromising the surrounding environment. 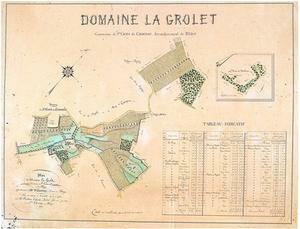 The vineyard is composed of 38 hectares (92 acres) of primarily clay-laden soil in the Côtes de Bourg. Varietal composition consists of 65% Merlot, 30% Cabernet Sauvignon and 5% Malbec, which contributes to the wine’s somewhat tannic character. At an average per bottle price of $14.99 the wine represents a very good value in a superb vintage for Bordeaux. Earthy nose with mineral, menthol and black cherry hints. Medium-bodied with moderate acidity and firm, dry tannin – good balance. Black cherry palate with dark chocolate, anise and stewed black currant notes. Moderate length with a tight, compact finish and a hint of cedar and spice on the aftertaste. Needs a bit of time, perhaps another 2 to 3 years will improve the wine. Good value. With all the hype surrounding the 2009 vintage in Bordeaux I have taken to looking for smaller, less expensive properties. Thus far the strategy has paid off, producing a spate of low-to-mid-priced wines that have the unmistakable flavor profile of classic Bordeaux from a great vintage. 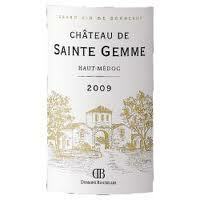 The Sainte Gemme is a blend of 50% Cabernet Sauvignon and 50% Merlot coming from vines that are on average 20 years old. The vineyard is approximately 10 hectares (24.3 acres) and is on soil composed of a mix of gravel, clay and limestone, which likely accounts for the minerality on the nose. The estate is what I would call mid-sized, producing approximately 80,000 bottles per year. At an average per bottle price of $19.99 the wine represents a very good value in a superb vintage for Bordeaux. Minerally nose with menthol, eucalyptus and black cherry hints. Medium-to-full-bodied with moderate acidity and firm, dry tannin – good balance. Dark fruit core with gamey, dried cocoa notes – herbaceous. Moderate length with a classic Bordeaux finish. Drinking well and should improve for another 3 to 5 years.